Dinner @ Noon - Helping Hands for the Homeless & Hungry, Inc.
Dinner at Noon serves a hot lunch every Saturday from September until June at the Carver Center in Port Chester. Since its inception, this program has provided over 40,000 volunteer-prepared meals. Additional support is provided by our generous friends at the Rye Town Hilton and Renaissance Westchester Hotel in Harrison. Volunteers from each of our member congregations' staff serve and donate food items on a rotating schedule. 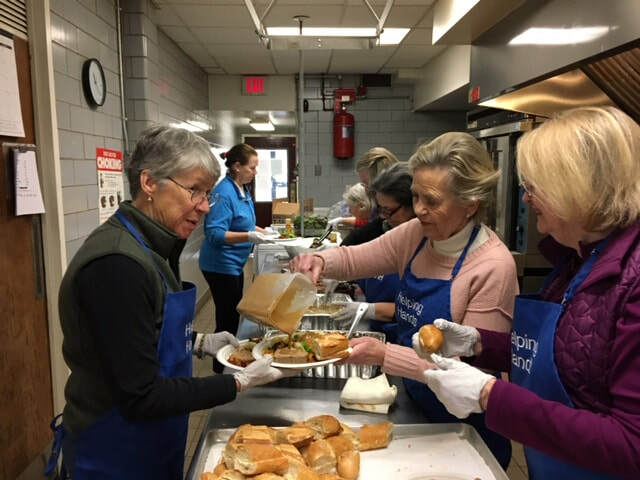 If you are interested in volunteering, please contact Helping Hands Dinner at Noon Senior Coordinator Ann Goldsmith at anngoldsmith@optonline.net or reach one of the Coordinators below.